Wines made from the Syrah grape typically exhibit intense aromas blackberries, pepper as well as floral scents. 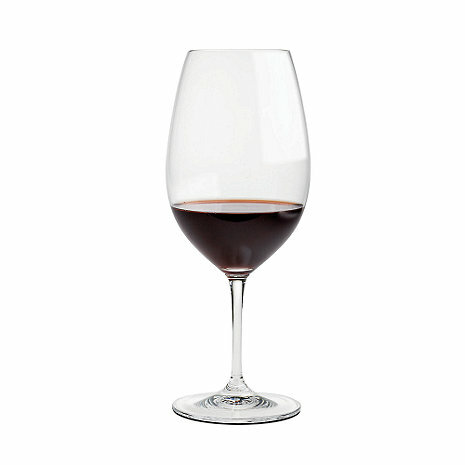 The narrow rim of the Riedel Vinum Rhone / Syrah wine glass directs the flow of wine to the mid-palate, allowing you to experience the wine's silky texture and sensuous fruit flavors, while the tannins flow to the back of the palate for a smooth finish. Recommended for: Amarone, Barbera, Rhone (red). I prefer the Vinum Shiraz than the Vinum Extreme Shiraz glass. Both are great but Extreme series cost a little bit more. Extreme is more stable due to the design, but Vinum is taller thus hold the wine better. Riedel or every expensive wine glasses is delicate so it's not a con. You can spend more money on accessories so to make it dishwasher safe. But why bother? I just wash my own glasses. We love these glasses, but I find them a bit hard to hand dry (my hands can't get in most of the grape styles!). Very high quality at an attractive price! We bought these glasses to enjoy our favorite malbecs, and they really are perfect for enjoying these full-bodied, aromatic reds. Can be used even for Zins and Cabs. Of all our glasses these are used most and are our favorite gifts to - especially - new to wine people. Great gift. when friends and family are over and are having wine i use them. I believe red wine has a better favor using these glasses. The glasses are beautiful. I've completed my set. I am truly - very happy with them. Love the Vinum series. You can put in the dishwasher and not that expensive to replace if you break one. These glasses are a superb value and are great for everyday as well formal dinning. Given the proliferation of glasses for different varietals I think the Rhone style is the best all around red wine glass.